Image Size: 12 X 15 in. 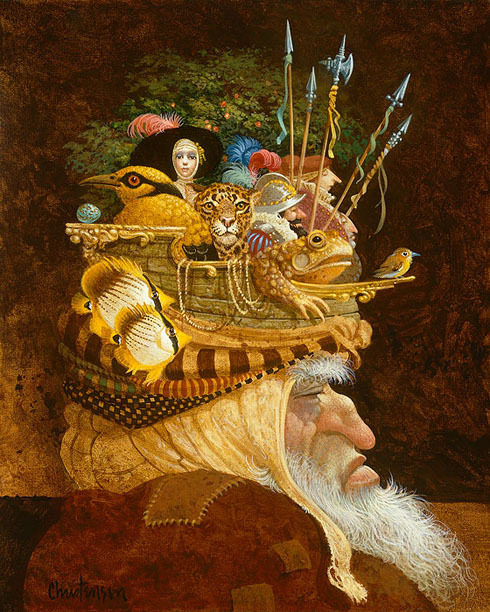 For everyone who ever wondered “WHAT is that guy thinking?” James C. Christensen allows us to peer into this old fellow’s head. In another typically “Christensen” gift to his audience, the answer only leads to more questions! Who is that woman? What’s with the leopard? Which battle did those soldiers march in from, and what about the birds, fish and frog? Even if we asked the old man to explain, would he? This old-timer may seem absent-minded, but after a lifetime of experiences, he really just has a lot on his mind!